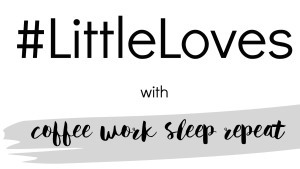 This week has literally flown by, it only seems like I wrote last weeks #LittleLoves post the other day. It almost seems a struggle to think of what new things we've been loving this past week, but of course there are some! I read Hayleys post "How I earn over £1000 a month from blogging" and found myself agreeing with everything she said and thought it would be useful for new bloggers or bloggers who were looking to start earning from their blog, so I'd defintiely recommend having a read. I've also been debating starting up my monthly income reports again as I really enjoyed writing them as it gave me motivation to work. I got into watching Coldfeet a couple of years ago and only watched a few series but I was hooked! I recently found out the new series is being aired later this Autumn so I need to finish watching the rest of the box set and catch up before it does. I can't wait! I was on the train to Manchester on Tuesday for the day and was listening to the top 40 UK playlist for the week on my phone. I'm not really into music at all and only really listen to in in the car or when Amelia asks for me to put it on the TV, however recently I've enjoyed having the top 40 charts on in the background. I've found this song by Major Laser ft Justin Beiber really catchy. I treated myself to some semi-permanent eye lash extensions this week as I had some time to myself for a few hours on Thursday. I've never had them before so thought I'd give them a try. I love them, and the fact that I don't have to put mascara on! They'll be perfect for holiday, so I'll defintiely be going back to get infills. I've been eating a lot of paninis again recently, a couple of years ago I went through a phase of eating them every day for lunch for months! It's been nice trying new fillings again instead of just ham and cheese or bacon, brie and cranberry. This week we enjoyed a day out at The Greenwood Forest Park with the kids. Amelia has been a few times when she was younger but it was nice for Harry to be able to do things this time too. Despite the weather we all had a lovely day and Amelia loved being able to go on the rides as she was a lot bigger this time. I'm so tempted by lash extensions, yours look gorgeous! I think I might give them a go.